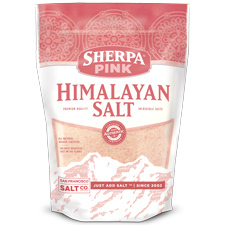 Sherpa Pink® Fine Grain Himalayan Salt is an excellent salt to use for cooking and baking. Use the fine grain Himalayan Salt while you're grilling or on veggies, potatoes, or eggs. This grain sizes adds a slight crunch and the perfect amount of flavor. Himalayan salt is a raw, unprocessed naturally harvested salt that is full of trace minerals.